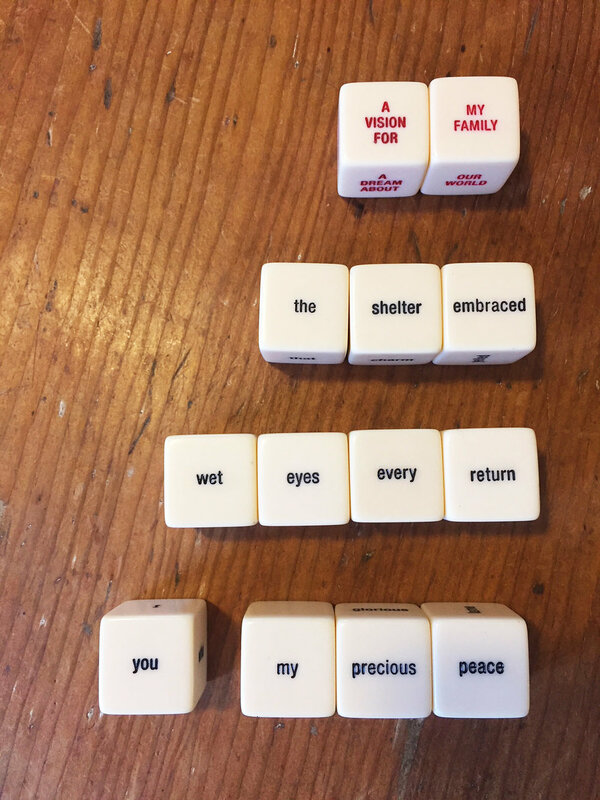 A friend introduced me to these little gems, Haikubes, and I was giddy and willing. "I thought you might think them too gimmicky," she muttered. Are you kidding? Gimmicks get me to the page and keep me going. I've long advocated for writing exercises. In my early days I pledged allegiance to Natalie Goldberg's Writing Down the Bones, then Julia Cameron's Morning Pages. Years later, I still rely on writing prompts to keep my mind open and my hand moving. From magnetic poetry to cross-out creations, every good gimmick tricks the mind. The best writing exercises stir the brain, but not too much. They provide structure, but loosely. Once the foundation is set, you let it flow. You don't try too hard. You don't worry about grammar or spelling. You don't edit. You keep the hand moving. It's all warm-up, this writing, this life. "If you find yourself caught in a bigger rut, what you really need is a new idea," writes Twyla Tharp in The Creative Habit, "and the way to get it is by giving yourself an aggressive quota for ideas." This, I think, speaks directly to writing exercises. They are timed, structured, and demand delivery of goods. "A lot of interesting things happen when you set an aggressive quota, even with ideas," she continues. "People's competitive juices are stirred. Instead of panicking they focus, and with that comes an increased fluency and agility of mind." Go to a cafe. Or go to a park. Or go to a library. Or go down to the river. Write for fifteen minutes at a steady pace without stopping. Describe what's in front of you. You can describe the whole scene, or just one object. Don't write about anything except what you see, hear, touch, taste, and smell. Don't write your feelings, opinions, or reflections. Wite color and shape. Write sound. No feelings. No opinions. No thoughts. These writings connect you to the world, to where you are. The more you do them, the more aware you become. They are pure training in sensory observation. Will these exercises produce strong stories or keeper poems? Maybe, but not likely. But they will provide a warming and a stretch. For every dance, there are the first tentative steps. For every song, the initial wobbled notes. Writing exercises and "gimmicks" are the first clearing in a brambled hike. They help start the walk that will expand your view. What gets you writing? What's your gimmick?